Not all trade show leads are created equal. Some people will be a better fit as a potential customer than others. But amazingly, only 41% of organisations have use any sort of scoring or ranking system to differentiate their hot leads from the cold. 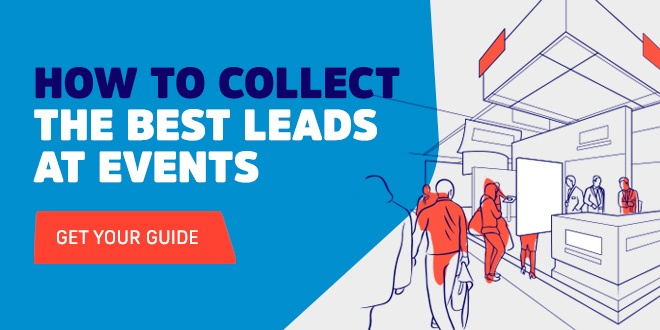 We’re looking at what makes a good lead, and the different types of lead you’ll get from every trade show, so you can establish a ranking system that works for your company. Put simply, the hot, highly-qualified leads from your event stand or booth are your Event Qualified Leads. They deserve prioritised attention from your reps, and speedy follow-up after the event. They are senior enough within their organisation to make key purchasing devisions themselves, and are someone that has the potential to be a great fit for your business. Next up are the leads that are almost a good fit, except they’re not the right person for you to speak to. They could be in too junior a role to have purchasing authority, or they could be in the wrong department. These should be categorised as MQLs, and nurtured with this in mind. Perhaps they can introduce you to the most appropriate person for you to speak to within their organisation? A warm introduction from a colleague will get you more attention from the decision maker than a cold email. These people are too early in their buying process to be classed as a hot lead. They’re in the learning and information gathering stage. It’s likely they’ve come to the trade show to speak to a number of different exhibitors about the problem they’re looking to solve. They will then go away and compare and research more about the different exhibitors. These should also be counted as MQLs, and followed-up promptly to keep you top-of-mind, ahead of the competition. Hopefully your sales team can provide them with additional information and nurture them through the buying process. Next you get to the poor-fit leads. These are the people that come to your stand just because they’ve spotted someone with some interesting-looking freebies, or they’re killing time between talks or meetings and just want to chat. You’ll likely end up taking their business card or scanning their badge, but you know you’re unlikely to ever hear from them again when you follow-up. As well as generating new business leads, organisations often use trade shows and events as a chance to catch-up with existing customers. You may identify upsell or account expansion opportunities when talking with existing customers, that you’d like to follow-up on after the event. You may want to class these as Event Qualified Leads, to ensure they get followed-up promptly, but you also want to make sure it’s their account manager who follows-up rather than your sales team. When collecting leads at a trade show, quality beats quantity. There are three things you need to turn a contact into a good, Event Qualified Lead. Hopefully, this is the easy bit. Whether you’re collecting business cards, using paper forms, hiring badge scanners or using a more sophisticated lead capture solution, you’ll always collect a person’s contact details. But on their own, how useful are those contact details? Not very. You need more information to turn that contact into a lead for your business. As your reps talk to prospects at your stand or booth, they will learn a lot about the person’s reason for being interested in your company’s product or service. They’ll also learn about their pain points that have inspired them to learn more about potential solutions, and their requirements for selecting a new product. This is all useful context that your sales team will need when they follow-up with this prospect. So as well as recording people’s contact details, you should have a way to record the context from their conversation, to improve the follow-up. The third part of a good lead is their potential to become an actual paying customer. If it’s clear they’re a poor fit for using your product, then they’re not a good lead. You might be able to go through the sales process and convince them to sign up for your service, but if they’re not a good fit and won’t get any benefit from using it, you can be sure they won’t renew for a second year.